Four years ago, I was taking the Metro from the Minneapolis/Saint Paul airport to downtown Minneapolis for a conference for work. The train car I was riding in was full, as many people were returning home from a busy days work and, though we passed sights like the Metrodome, Minnehaha park, and columns of tall important buildings, I saw none of them. I simply could not pull my eyes away from the words I had just read in The Art of Fiction by John Gardner. I had, what many artists might call, a breakthrough. I struggle with my work you see. Though I have read much about Tolkien and his “sub-creation”, I had yet to discover the joy of telling a good myth. I had the impression that the word “fantasy” was synonymous with escapism, which many authors would say is true. I have read many books about the craft of writing. In them, nearly all of the authors consider fantasy rubbish. The unfortunate reality about reading their take on literature and writing style is that you tend to respect what they say since they are accomplished; they “made it”. The problem I had was that I was (and am) writing fantasy. At the time (and I do have relapses now and again) I maintained a passive-aggressive love-hate relationship with my novel. I knew the story had to be told and the characters begged me to continue. They wanted to live, and I wanted them to live. I just did not want my work to turn into one of those novels you see in the “free” bin outside secondhand shops. You know, the guy has a bare chest, rippling muscles, has one hand around a chain that connects to the collar of a snow leopard, and his other arm wrapped around the waist of the same old voluptuous girl you see on the cover of many fantasy stories. Yes, in other words, recycled trash, or escapism. The solution, or breakthrough, where I was finally at peace about writing fantasy is when I read about what a fantasy actually could be. John Gardner was a man some considered a literary genius, and I was thrilled to find an explanation of a fantasy or tale in his distinguished book. Here is what I came across. The setting of a tale is customarily remote in either time or space or both…The landscape of a tale is of a kind likely to inspire the reader’s wonder–lonely moors, sunny meadows, wild mountains, dark forests, desolate seacoasts–and both natural and made-made features of the setting are frequently of great age…the principle of causality in a tale is psychological and morally expressionistic, or poetic… (Gardner, The Art of Fiction Pg 72-73). So therein lies the high aim of fantasy, and my novel, per Gardner’s take. Inspiration to fill the reader with wonder in the form of a poetic story. If a fantasy or tale is written like this, it could hardly be considered literary trash. Thanks Mr. Gardner. Sometimes writing is something you chug along at by yourself. Other times you are hopelessly dragging and just when you think you simply cannot go on, there is a writing eucatastrophe and you are encouraged to once again pick yourself up and march back to the page. Many things can elicit these feelings of motivation for a writer. This could be a professor who makes sense of a writing secret, an article that someone shares with you about the writing process, or a pat on the back from someone in your writer’s group. I wanted to take this entry to mention two great places to find that little burst of energy. Andrew, my good friend who is with me on the quest for publication has started his own blog. I bring it up because it has been a tremendous encouragement to me. I highly recommend you to visit his personal blog and the Breathe writing conference blog. Both of them are great tools for garnering the gumption that you need to get moving on your stories. For us part timers, writing can be something that gets pushed aside and otherwise edited out of our busy schedules. I believe it is detrimental to the survival of our stories to both develop habits that advance us as story tellers (250 words a day?) and also have reminders set up around our house or work space that help us focus our minds on the task of writing. You know what I mean. All of a sudden, a month goes by and you are struck with a horrifying thought. I’ve only written about 50 words! Below are a few things that I have placed around my apartment to remind me of my goal everyday, no matter how busy my schedule can become. Welcome to my world. First and foremost. 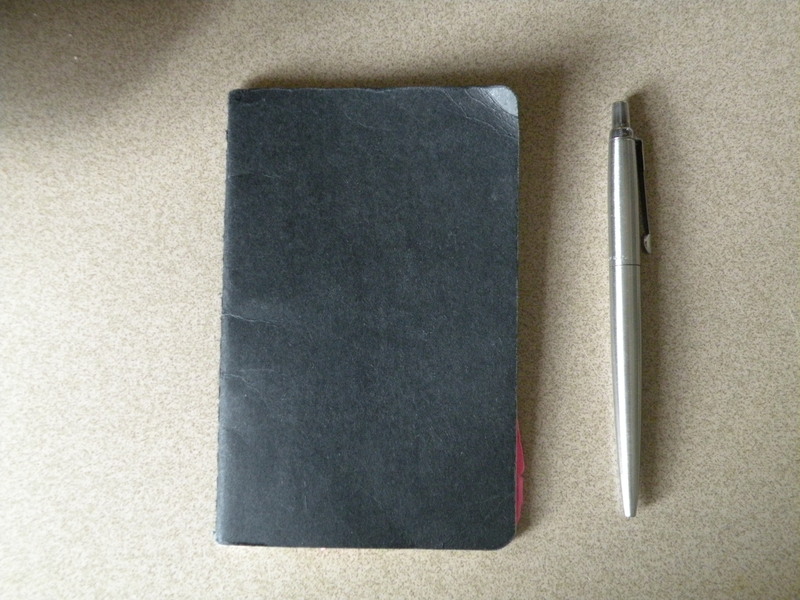 My Moleskine journal and Parker Pen. These go with me everywhere and I’ve went through several. No matter if its the grocery store, a traffic jam, or a walk to the mailbox, I have a place to write down ideas when they strike or when I have a spare moment. Okay, I am not trying to point out the obvious here, but this one should come as no surprise to any of you. Bookshelves filled with books. If this is not a given when pondering what inspires you to write I don’t know what is. After all, you are trying to write one of these. If you did not already think I was a nerd, here is, once again, an obvious clue that I am one. 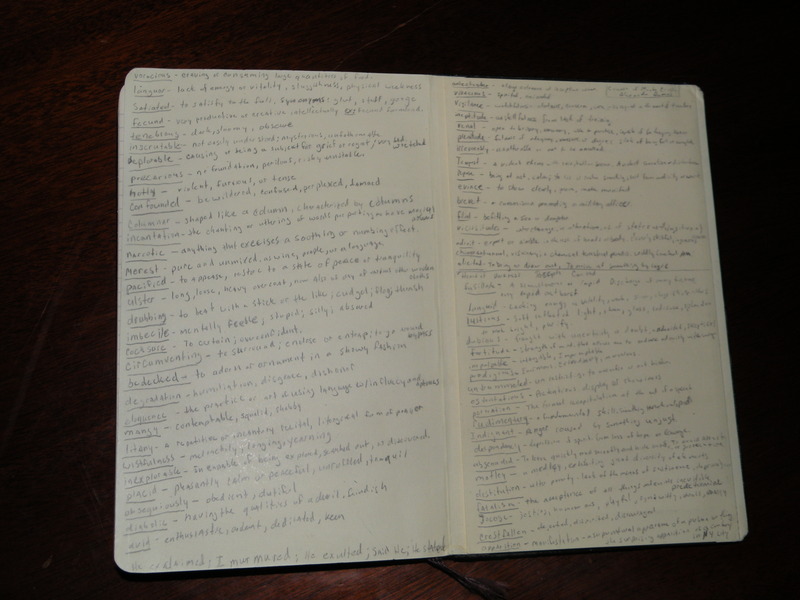 I keep a collection of words in the back of my journals -complete with definitions- so as to expand my vocabulary. Not quite as fancy as laminated flash cards, but they do the trick. I collect expressions that hit a mood perfectly, and words I either do not know or have never thought of using before. This next picture is of my L.C. Smith & Corona Typewriter. I see it everyday as it sits on my dresser with a paragraph from Jules Verne’s From the Earth to the Moon.This behemoth weighs about 40lbs. 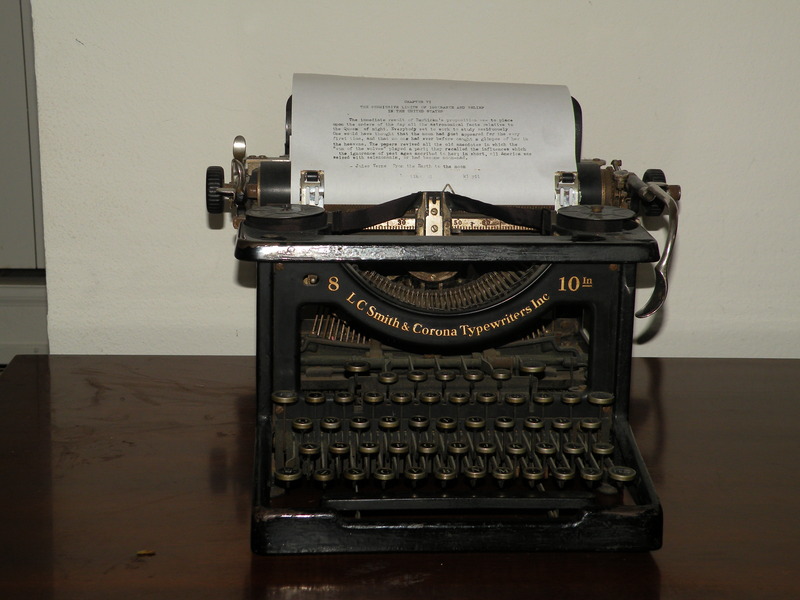 You may think, “Why would you keep a cast iron typewriter around?” My response, “Does cool need a reason?”. It is also another reminder of what I want to do. 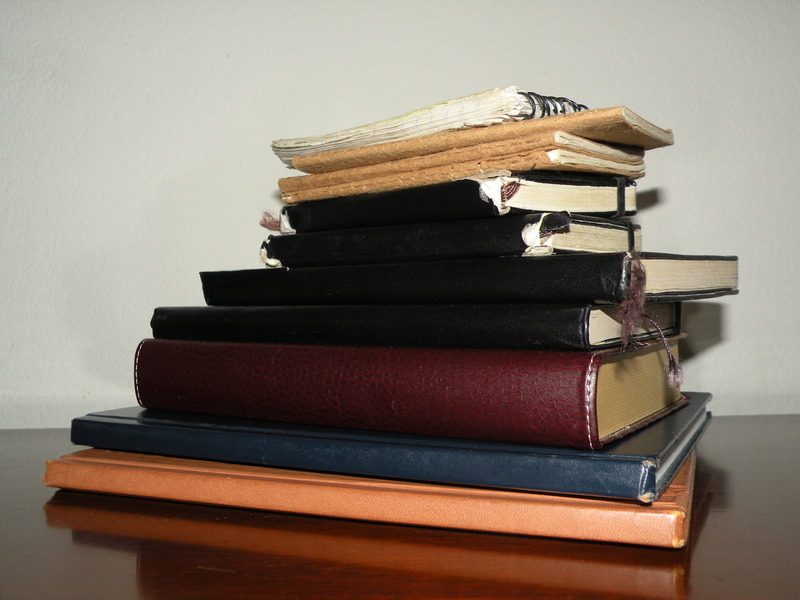 Journals. I CANNOT stress enough how important it is to journal. Not just about writing, but about life. These particular journals span my college years to now (10 years). I hope to be able to keep going. It is tremendously satisfying to finish one. Also, if you are going to start a journal, remember to date your entries. Ah, now these are things to be proud of. 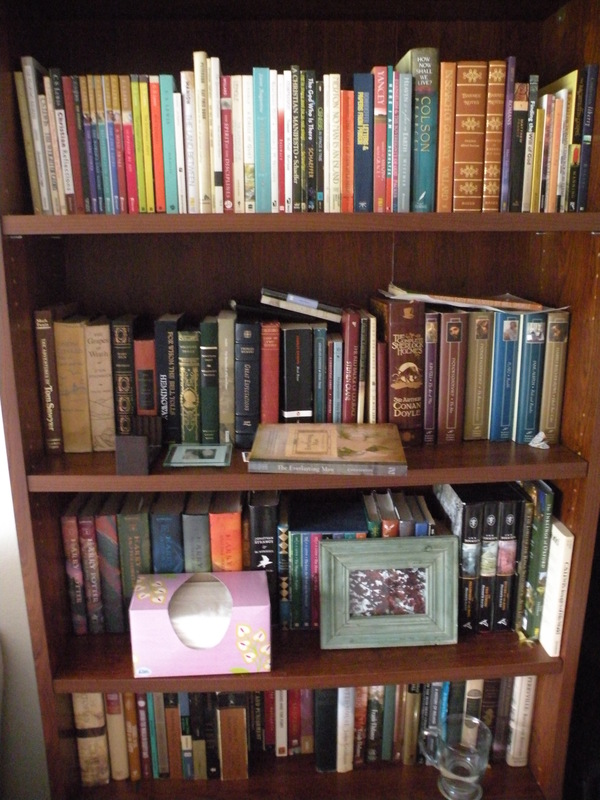 Here are books I have written. 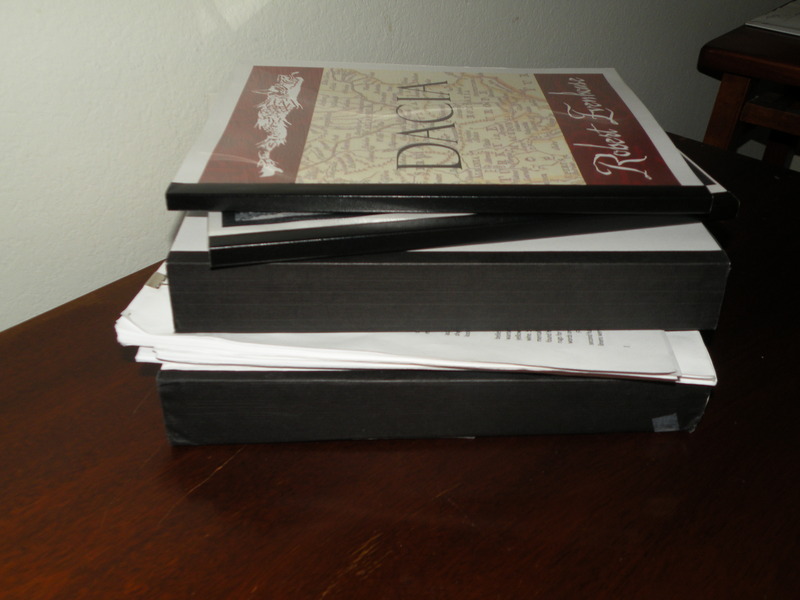 Some are novelettes (25,000 words or less) and my current novel (89,000+ words). I have my wife, writers group, and many many friends to thank for their completion.I am grateful to you all. Ever wonder how a chapter takes form? Does it come out cleanly like a white shirt in a Tide commercial? No, no, no, and emphatically no. Most of the time its fools gold with bits of gold hidden inside. But its nice to have a place to organize it all beside my forgetful mind. 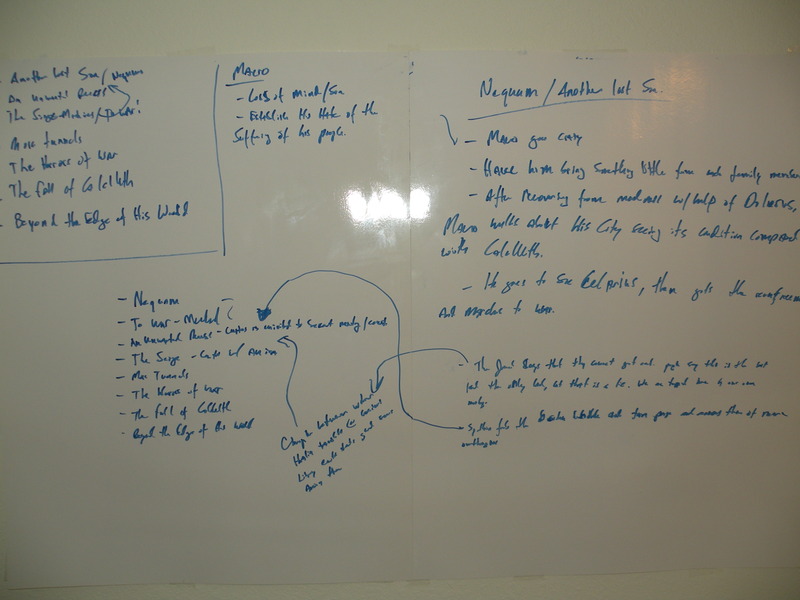 This sits on the wall, right by my bed, so I will remember every night before I go to sleep that I am writing a novel. So there’s a little insight into my writing life. I hope this can inspire you to get a notebook to always keep with you, a poster board from your local grocery store to start outlining, or to purchase a journal to help remember important life events. Writing is a thrilling thing, however fickle it can be.